Y’all. I made a really good, healthy granola. It has no added sugar and makes your house smell AMAZING! 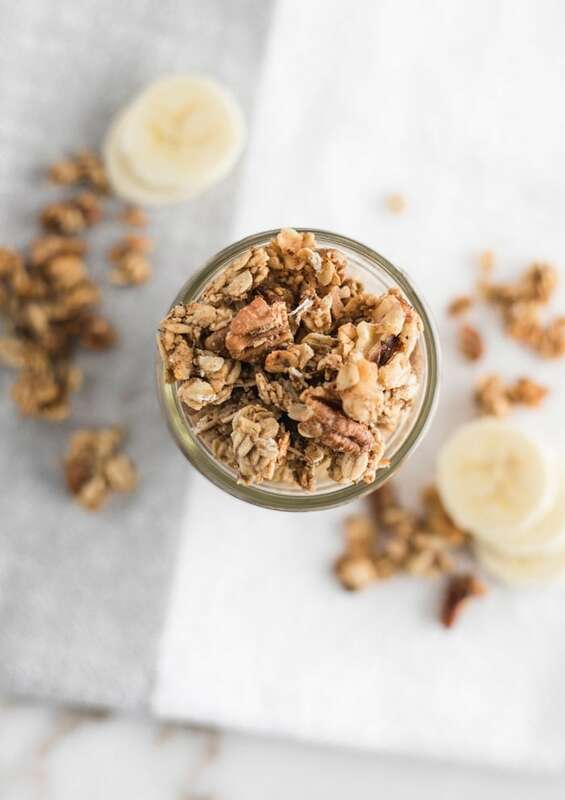 Because it’s BANANA BREAD granola! Who doesn’t love banana bread? And now you can have your favorite bread in a healthy granola. Yum! I made this while trying to use up some bananas that were past their prime. Which for me is the day after they get home from the grocery store. I like green-ish bananas. Any more ripe than that, and my bananas are destined for pancakes, muffins, or this yummy granola! Anything banana bread-like always brings back memories of a delicious smelling house and anxiously awaiting a beautiful loaf to cool before my siblings and I could dig in to some of the best banana bread in the world! I think my mom used the recipe from an old Betty Crocker cookbook, but there was something that made it so special and yummy to me. It’s still one of my favorite treats. 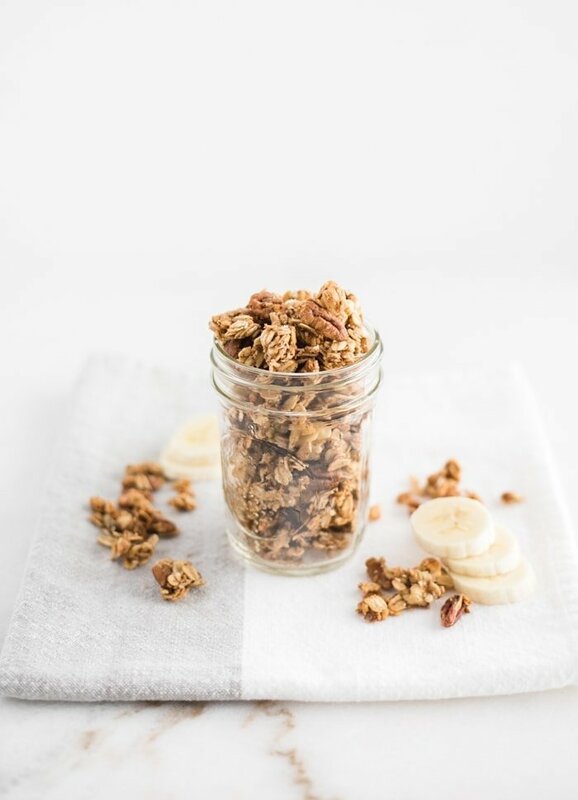 This granola captures all of the delicious flavors of banana bread in a healthy, portable snack. And it’s super simple to make with only a handful of ingredients and a couple easy steps. 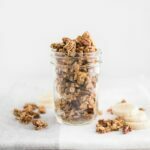 This recipes has got pecans and walnuts, but feel free to use any nuts (or no nuts) if you’d like. 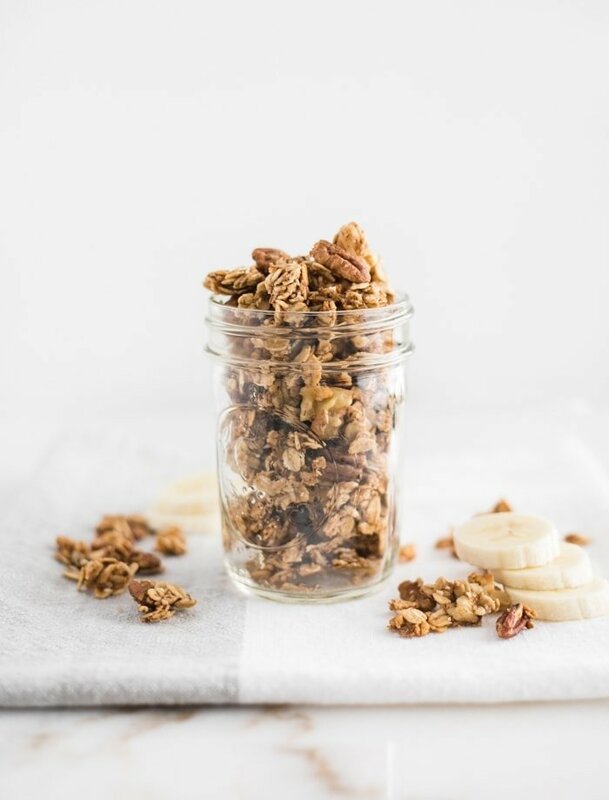 Bake it a little longer for a crispier granola, or a little shorter for a softer granola. Either way, its nourishing and delicious! Preheat oven to 300°F. Line a baking sheet with parchment or foil. 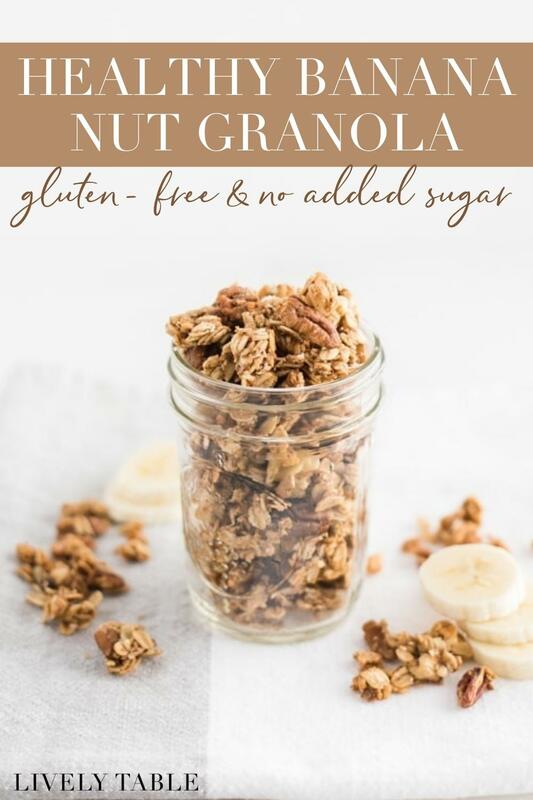 In a large bowl, stir together oats, nuts, cinnamon, nutmeg, and flax. In a separate bowl, mash the banana. Add oil and vanilla and whisk until combined. Pour banana mixture into oat mixture and stir to coat everything. Pour onto prepared baking sheet and press evenly in a single, chunky layer with little to no white space. Bake 30 minutes without stirring. Remove from oven and let cool before breaking into pieces.